The Local Heroes project brought members of a local Active Age group, the 91Club, and children from Ballymahon together to explore stories and to research together. 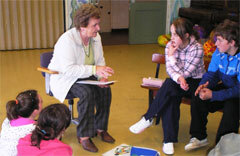 To prepare for their meetings with the members of the 91 club, the children explored a variety of topics with Chris. They read the "local heroes" stories from the 1937 / Folklore Commission Schools' Folklore survey, a fascinating and valuable resource. They even designed a new superhero for Ballymahon. They explored old newspapers to find out more about the area in the past. They learnt how to be good listeners and scribes. When they met, each group decided on topics that they could continue to research together. Click on one of the links below for more information and pictures.